Chanel Iman and Jamie Chung pose for a photo while attending Belvedere Vodka x Noisey: Behind the Scene at the Ace Hotel on Friday (April 21) in Palm Springs, Calif. The ladies are back in the desert for the second weekend of the 2017 Coachella Music Festival. “Back in the desert! Tonight’s look @thenaventwins available at one of my new favorite sites @ShopMKC,” Jamie captioned the below photo on Instagram. FYI: Chanel is wearing a Roberto Cavalli sweater and black leather fringe shorts. Jamie is wearing a Naven dress and an UNOde50 necklace. Lady Gaga is preparing for her headlining set during the second weekend of the 2017 Coachella Music Festival and she shared a photo of her makeup test! The 31-year-old entertainer’s makeup artist Sarah Tanno put flowers on Gaga‘s face for the fun festival look. “Coachella makeup test. @sarahtannomakeup @fredericaspiras hair. Up for showing us your version?! Can’t wait to sing for you and see all your looks!! #Gagachella,” Gaga captioned the photo on her Instagram account. Make sure to get the scoop on Gaga‘s concert set list from last weekend! Kylie Jenner and Tyga both hit up Coachella over the weekend and the former couple reportedly bumped into each other! Right before Kendrick Lamar‘s set on Sunday night (April 16), Kylie and Tyga, who are currently on a break, ran into each other backstage. According to People, the exes “shared an awkward hug” before heading to watch the show. “Kylie looked really sad as she walked away,” the source added. Although the encounter may have been awkward, it looks like Kylie enjoyed the rest of her time at the festival. She even hosting a party and was spotted hanging with Travis Scott! 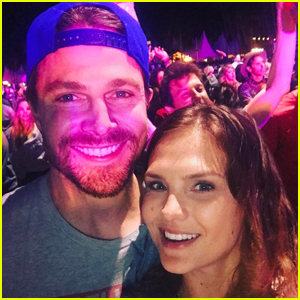 Stephen Amell used to be a Coachella hater but his wife Cassandra totally changed his opinion! 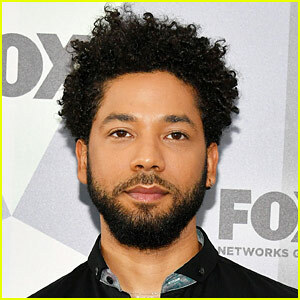 The 35-year-old actor took to his Instagram to explain that he always poked fun at the festival that Cassandra loved. “Ever since we met in late 2011, my Wife has raved – no pun intended – about Coachella. I decided – in a semi joking way – that I was going to hate it for no reason whatsoever. And I’d poke fun at her when the set list was released and she’d get excited,” he began. Stephen went on to explain that while Cassandra continued to go to the festival, he stayed home, until he realized that’s not what a marriage means. Katy Perry and Rita Ora meet up with designer Jeremy Scott while attending the Moschino and Candy Crush Celebrate Coachella 2017 party on Saturday night (April 15) at a private residence in Coachella, Calif. There were a bunch of stars at the event and they kept the party going until 5am! Emily Ratajkowski, Stella Maxwell (with girlfriend Kristen Stewart, not pictured), Riz Ahmed, Charli XCX, Kylie Jenner, Ashley Madekwe, and more stopped by the event. The night ended in a dance party on stage with Katy and Jeremy dancing to their pal Mia Moretti‘s DJ set.